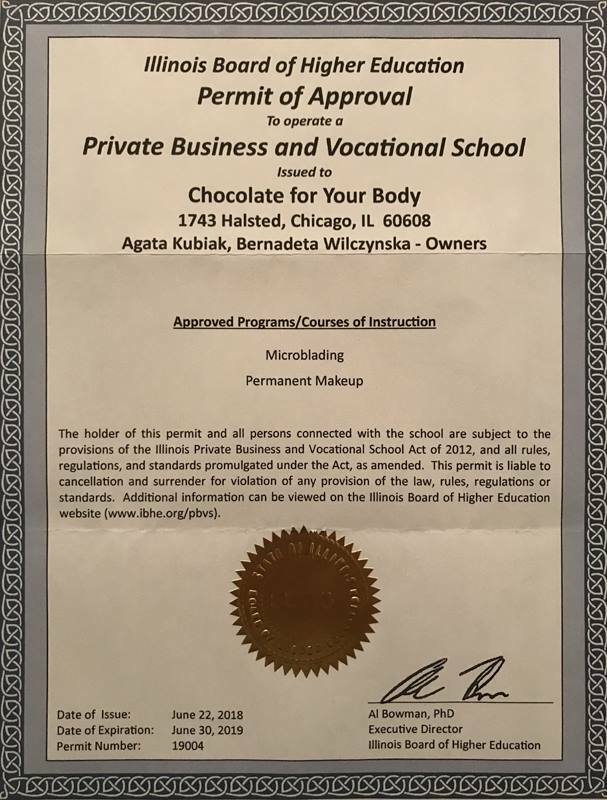 In 2011 I became the owner of Chocolate for Your Body Spa, located at 1743 S. Halsted St, Chicago.I started my cosmetics career in Poland where I obtained my Cosmetology License in 1994. I moved to the United States in 2003 and have since been continuing my training and expanding my knowledge by attending a variety of beauty courses and working in the cosmetology environment. I have a diverse experience in facials, body waxing, chemical peels, and cosmetics. Specifically, I am highly skilled in permanent makeup procedures. Due to my expertise and professionalism, I can create a pleasing look that compliments my clients’ facial features and skin tone. Moreover, I am extremely capable of analyzing and determining suitable treatments for my clients’ personal appearances using the latest technology.